The meeting of humankind and nature on a brisk hike can inspire and invigorate and comes with an abundance of health benefits. I hike because I love to be in nature and experience the beauty around me. The polluted city air pales in comparison to the brisk fresh air of a nearby state park. Beyond that, I love the journey and how each step moves me one foot closer to my goal of getting to the end. As humans, we love accomplishing things, and there is nothing quite like the feeling of accomplishment after you have reached the peak of a tall mountain. Though hiking can be a cost-free pursuit, there are many ways to enhance the experience. Having a comfortable, lightweight backpack is one of the ways to do that. I'm going to look at the best hiking backpacks, taking into account a range of specifications that can improve your long walks in the wilderness. From capacity to cost to durability, our hiking backpack reviews cover the top backpacks on the market in terms of quality, comfortability, and price among other things. As mentioned earlier, we measured the lightweight design with the overall durability and quality of construction when choosing our top packs. We also considered other factors such as breathability, cool features and organization, and of course overall value. Without a doubt, we only chose brands that had an excellent reputation in the marketplace and have been known to deliver on everything they say they do over time. 1) Hiking Backpack Buyer’s Guide – If you are interested, we tell you what to look for in a hiking backpack and what we used to rate our top packs. If you just want to see the top packs for each category, just skip down to section 3, 4, or 5. In each of the three sections we listed our “Editors Choice” Top pick along with our “Best Value” pick for affordability. 2) Top Hiking Backpack Brands – In this portion, we shared our favorite brands among the many to choose from in the market place. Again, we only mention the best. 3) Best Extended Trip Hiking Backpacks (5+ Day Trips) – First, we outlined the best extended trip hiking backpacks for those going on those long hiking and camping trips that go for a week or longer. The packs are larger in size, but are still great to use. 4) Best Multi-Day Hiking Backpacks (2-6 Day Trips) – Next, we laid out the top multi-day hiking backpacks that serve the needs of those hikers going on trips for longer than a day, but shorter than a full week. 5) Day Hiking Backpacks (1 Day Trips) – Finally, we noted the top 5 packs for those day hikers out there. As always, we made clear the absolute best day packs for hiking and gave a few options at the end that serve the affordable consumer well. Feel free to skip down to whatever section you are looking for or read through the whole article if you want to be best informed on the top hiking packs on the market. After finishing the article, we recommend our latest list of the T﻿﻿op 1﻿﻿0 Day Hike﻿﻿s in all of the United States. I hope you check out a couple! As hiking has evolved as a hobby, so too has the required gear. The breadth of backpacking gear on the market can be overwhelming. Let's take a look at some of the important factors you want to consider when choosing your next backpack. The needs of the backpack change based on the type of hiking trip you are going to take. Personal Needs should be at the top of your list of requirements when buying a new backpack. Each hiker’s needs are different. Think carefully about what yours are and choose your backpack accordingly. The most important aspect when deciding this is size. Sizing of backpacks are made in liters which is the amount of liters of water that could fill the backpack. Hiking packs can range from smaller day-trippers of 20-40 liters (think 40 1-liter Nalgene bottles) to larger expedition sizes upwards of 75 liters. It's important to choose the capacity that's right for your trip. Are the materials durable? Are the seams well stitched? Is there all-weather coating on the outer cover? There's a lot to think about in choosing the best-made backpacks. It is incredibly important when buying a good hiking backpack as you want one that will endure all kinds of weather and terrain. No matter how hard you try to avoid it, your backpack will be abused by the great outdoors. Hey, you’re in the great outdoors after all. It’s important to choose one that will be long-lasting and give you good value over time so you aren’t having to shell out more cash a year from now (unless you want a new one). We only reviewed the best of the best hiking packs and ones that had an excellent reputation and that lasted the test of time. Internal frames are better at load bearing but because they hug the body, an external frame is better for ventilation. Although often times the frame is overlooked, it is certainly something to consider depending on the climate you're hiking in. The features certainly of a pack certainly play a role. The features should be matched along with your personal needs. Will you be hiking on terrain that requires a lot of tools and extra accessories? Then you need a back with big belt loops and lots of pockets. Will you be sleeping outdoors? A camper will soon feel the benefit of a special compartment for a sleeping bag or wet laundry. We certainly made sure to consider the best camping backpack reviews in our extended trip choices. The price should feature less prominently on your list of requirements as a backpack is a long-term investment. However, for many, it is still important. Casual hikers can afford to look at cheaper models, while serious trekkers will see the benefit of more expensive lightweight materials and construction that provides durability through any journey. If you are going to take hiking seriously, take your pack serious as well. As you will come to notice, I mostly recommend the following three brands in my hiking pack reviews: Osprey for overall quality and versatility, Deuter in a close second, and lastly Teton as our value pick for those looking for a great backpack at an affordable price. We also really liked CamelBak for the shorter range hikes as their packs are smaller and lightweight with an awesome hydration bladder system. As mentioned later, I simply love using the CamelBaks. Let's take a closer look at them below. Hailing from the state that gives us Silicon Valley and Hollywood, this Californian company is incredibly innovative in its backpack design and is relentless in their quality control and customer service. Born in 1974, it now dominates the hiking backpack industry and continues to build on its pioneering reputation. It is a well-known and the natural choice for buyers given its popularity, ubiquity on the trails and overall reliability. It’s fair to say that your first Osprey may be your last backpack purchase for years to come due to great manufacturing and legendary service. The company offers a lifetime warranty, showing serious confidence in the product. They gladly repair or replace (if necessary) any backpack anytime! ​Below you will find reviews of the best Osprey backpacks available on the market today. Deuter is a serious heavy-hitter on the hiking backpack market. Founded in Germany in 1898, this company used to provide the bags for ﻿﻿Bavarian Royal Mail. Now that is some serious backpacking cred! From there, the company continued to grow and has long been one of the first choices of suppliers for European expeditions, and has provided gear for the German Olympic team for many years. These bags are well-designed, durable, and innovative. TETON Sports boasts cheaper prices than most big names on the market. For casual hikers who are more cost conscious, this could be a better overall choice. What you gain in extra money in your pocket, you perhaps lose in lightweight build and clever design. However, TETON Sports sees favorable reviews on a number of platforms even when tested over a longer period of time. They make great backpacks and are really building a name for themselves among value conscious hikers, as well as some seasoned trekkers. That among other things is why they’ve made our list. Are you about to go to a faraway adventure (or nearby park)? Do you need lots of space to keep all of your gear, clothing, and food? If you are going on a trip of 5 days or more it might be best to get a full sized hiking bag. Below, we start with our top picks and finish with our best affordable hiking backpacks choices which offer a super backpack at a great price. Let’s begin by taking a look at my first choice among the extensive trips section of our backpacking reviews. The Osprey Aether 70 is an incredibly lightweight backpack that has both the volume and the usefulness for longer treks. It’s no wonder why it is our overall top pack and the most comfortable hiking backpack that we reviewed or tested. The range of pockets offer superb ease of organization, and the hip belt has storage for tools and those all-important snacks. You'll feel like batman when considering the usefulness of the waist belt. Design and comfortability is right at the center of the positive feedback when reviewing this backpack. Zippers have large loops that make access easy when on the move or when wearing large gloves, and the chest strap buckle will share your load more evenly. Ventilation is great due to the AirScape back panel which makes it feel cool when you are burning up inside. The additional features, including the safety whistle and hydration panel are the icing on the cake and make this backpack a true all-star. The Aether also comes in a nice looking women’s model as well that ranks as the best women’s 70 liter pack. Need a little extra size for a slightly longer hike? Osprey also offers an 85 liter pack to make the longest of journeys an absolute breeze. This pack tops our list as the best thru hike backpack due to its spacious size matches its great features. With all the cool features of the Osprey Aether 70 it might be worth it to size up a little bit if you have a lot of gear or food to carry on your next camping trip. The pack offers nice hip belt pockets to keep your phone or camera handy with you at all times in case you see a bear and want a quick pic. Hopefully, you don’t see one (unless you live life on the wild side), but either way it is nice to have handy pockets where you don’t have to set your pack down every time you want to grab a snack. It’s got a nice wide mouth opening sleeping bag compartment and is well organized on the inside to keep your clothes and other items easily accessible. If you need a little extra space and want the best of the best packs for hiking on the longest of trips, go with the Osprey Aether 85. We promise, it won’t let you down. A new edition to the list is the High Sierra Appalachian 75. We have found there packs to be well put together structurally without sacrificing comfortability and coolness. The contoured frame bar shapes nicely to the structure of your back. Without a doubt, we loved the simplicity of the pack and how easy it was to change sizes to fit to your particular hiking build. The pack is very spacious on the inside with 75 liters of space. A few convenient pockets on the outside complete the outstanding features of the High Sierra Appalachian 75. With a few color choices to choose from, we know you will like the stylish appeal of the Appalachian 75 while being sold at a mid-range value price point. Click below to check the latest price. The Deuter ACT Lite is a serious hiker's backpack. The extremely durable material and abundance of different sized pockets accounts for some extra weight compared to other backpacks, but its utility and supreme construction are worth it. The lid has gear attachment loops that won't break under the weight of ice axes, wrenches, and other considerable hiking tools. The lightweight X frame, adjustable back length, and anatomically shaped shoulder straps make this pack a comfortable and a sturdy choice. The stretch pockets, wet laundry department and additional 10L of storage round out the features on this excellent backpack. Making the pick for “Best Value” in the extended trips category of hiking backpacks is none other than the Mountaintop 70L+10L pack. At a great price point at below a hundred bucks at the time of the article, we found this pack superb in quality and even better in price. The pack offers 10 excellent compression straps which makes shrinking the large size down easy to do and store away on an airplane. The back length is effortlessly adjustable to allow the pack to fit for your actual height. Like a few of the other packs listed, they offer a built in rain cover to protect you on your long journey in case of inclement weather. If you are hesitant to try out this newer hiking brand, you should feel secure to know that Mountaintop offers a 90-day limited manufacturer’s warranty in case anything goes wrong. Going on a long hiking or camping trip, but don’t want a humongous backpack that holds you back at the airport or weighs you down in the final days? We put together a list of our five best multi-day hiking backpacks that best suit those hikers going on 2-5 day trips. Personally, I like the mid-range size the most as it is not too big to weigh you down, but at the same time is versatile enough to go on long trips. If you pack well it can even be used on short day hikes if needed. Check out our outstanding list below. The ExoForm/ BioStretch shoulder raps and breathable back-panelling make for a very enjoyable hiking experience. The hip strap design also provides great weight distribution. A little smaller than the Aether 70, this weekend warrior our choice for the best 3 day backpack. The Atmos is very light and sports some great features. The pockets are well positioned and allow for easy access to water bottles and accessories while still on the move. The removable lid pocket also means that each hiker has more control over what the backpack looks and feels like on each individual hike. Simply take the lid off and leave it at home. There are still plenty of pockets you can use. For those looking for that nice midrange backpack, we believe Osprey delivers yet again with this exceptional 50 liter hiking backpack. It’s perfect for those shorter weekend trips without holding you back on those longer weeklong trips. We found this pack to be just the right size for success. **Key to note, it is not too big or obtrusive to take with you when you travel so for me, that is a real plus. Beyond that, we really liked the comfortable inside out compression straps and well-padded hip belt to keep the weight of the pack distributed to where your power come from, the legs. Perhaps the coolest feature that we liked is the integrated rain cover to keep your clothes and gear dry during those wet and blistery conditions. Personally, I can’t tell you how many times I’ve regretted not having a rain cover during wet outings. There are an excellent array of pockets found all around the pack. Without a doubt, we know you will come to love the Osprey Stratos 50 as we do. This is without a doubt our best 50 liter backpack choice. This TETON offering wins on overall value alone. However, the Scout 3400 is a great backpack with durability and style beyond its modest price. At 55L it's considerably smaller than my first choice, but once again, if your treks demand less gear than this may be the backpack for you. The adjustable torso length means that you can fit this bag to your stature, and its smaller size makes it suitable as carry on luggage if your hike requires air travel to get there. There's a bottom compartment for a sleeping bag, and a bungee strap up front should you wish to bring a sleeping pad or additional outerwear. Altogether, great value for your money and we know you will like this pack. The second Deuter backpack on my list is the Aircontact 60+10 SL Pack. At 60L, plus an additional 10L of storage space this pack is closer in size to my TETON Sports selection, but with the range of storage available it shouldn't be written off for longer hikes. Given it's size, the ACT Trekking Lite is naturally much lighter than the other models listed here, and the beauty of this pack is that the anatomic X frame and highly breathable back will make it feel even lighter still. The adjustable back size and removable 10L of storage allow you to fit this pack to your needs. We have found that the pack comfortably distributes the weight evenly throughout the pack. Like the ACT Lite above in the extrended trips category, it is also compatible with hydration systems and has attachments for ice poles and other tools if needed. We took a stab and decided to review another up and coming brand in the hiking space. The OutdoorMaster 50 liter backpack delivers a great pack at an even better price point. Although perhaps not the swiftest looking multi-day pack that we have reviewed, we wanted to make sure to offer an option for those extra cash conscious hikers. The price it is selling at is unbelievably low for the amount of space and size that it represents (50 liters). Just like the Osprey Stratos backpack listed above, OutdoorMasters offers a rain cover to keep the pack dry during heavy rain. A very nice add on if I do say so myself. Still, we found the pack to be very comfortable while having some useful organizing pockets, and a respectable waist strap to properly distribute the weight of the pack. If you are looking for a good multi-day pack at a fantastic price, for sure this OutdoorMaster hiking backpack is the way to go. Once again, Osprey easily finds itself at the top of our list for the top backpack for day hikes. They have an excellent brand and reputation that has held up over time. But beyond that, it is clearly the luxury brand in the hiking marketplace as they pride themselves on top quality packs that are durable and comfortable. If you are about to embark on another day hike, grab yourself one of the best daypacks on the market. Just click the titles or images below to see Amazons amazing prices and fast shipping. We love the Osprey Talon 22 as it has a nice size, 22 liters, but is still extremely lightweight and comfortable. Buying a lightweight pack is crucial for short hikes as you often times go for the more strenuous climbs when day hiking. The last thing you want to be is held down by a little extra weight as you are finishing your final mile. We know you will love the T﻿﻿alon 2﻿﻿2 as it has some excellent stretch mesh pockets and openings and a nice and comfortable hip belt as well. All these things considered, it’s no wonder this pack made our list for top hiking daypack in 2018. Okay, so you are probably thinking by this point, wow I am sick of hearing about Osprey. Sorry about that, but we only recommend the best of the best and Osprey delivers on all their packs. Just like the Osprey Talon 22 listed above, these daypacks have awesome front-zippered pocked and organizers throughout the pack making grabbing snacks on a the go a breeze. Just like all their packs, the ventilation is second to none which makes those hot, sweaty hikes much less miserable. Whether you are going hiking, biking, or just for a long walk, this is yet another great choice for your next daypack. For those willing to give those friendly Europeans a shot, Deuter offers a slew of first-rate hiking backpacks. Deuter, a German brand, delivers on great quality and excellent feel. You will not be surprised to find great reviews for their packs all over the world and particularly the S﻿peed Lite day﻿pack delivers on all phases of the game. It has a nice padded and breathable back panel to keep you comfortable along the journey. Really not too many negatives of note on this pack unless you carry large water bottles like a 32-ounce Nalgene. We have found the side pockets to be a tad too small to hold them. Priced securely in the same range as Osprey, we think you will like this Deuter Speed Lite Backpack if you decide to make that choice. CamelBak is yet another powerhouse in the hiking industry. They deliver some totally rad daypacks with a really cool water hydration system. Just like in anything, drinking water is so crucial to keeping you fresh and hydrated on your dayhike. CamelBak has delivered on this with their fun to use water hydration systems. Seriously, I actually enjoy drinking water when I can use there easy to use water nozzle where I can easily sip water without even lifting a finger. You just fill up the hydration bladder and then you are good to go. Beyond the cool water hydration system, we found this pack to be very comfortable and we absolutely loved its low profile design. Just like Osprey, CamelBak offers superb customer service and a lifetime guarantee on all their packs. If you want an excellent pack and need a fun way to drink water, we think you should go with this sweet Cam﻿﻿elBak Cloud Walker 18. We have found TETON Sports to be the up and comer in the outdoor hiking industry. As the brand is newer and less established, we saw that their packs are priced considerably less than some of the other high reputation brands listed above. Due to the excellent price point, the TETON Sports Oasis 1100 easily makes our best value pick for hiking daypacks. Beyond the great price, we loved that the pack was lightweight and comfortable to wear. 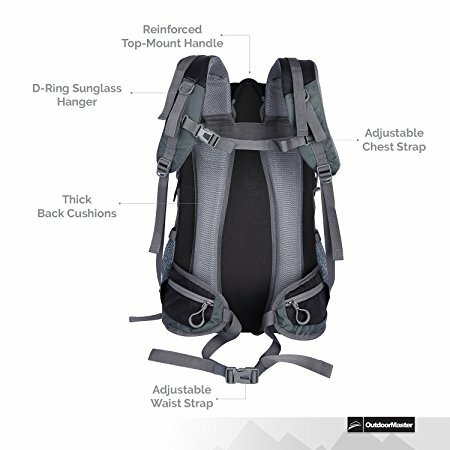 Just like the prodigious CamelBak Cloud Walker listed above, this pack comes with a nice 2 liter hydration bladder to make sipping water a cinch. In case you are afraid to try out a newer brand like TETON Sports, just know that they offer an excellent customer service and a limited lifetime warranty. Ready for an excellent daypack at a great price, we think you will love the T﻿﻿ETON ﻿﻿Sports Oasis 1100 pack. Conclusion: What Is The Best Hiking Backpack? Do you feel like an expert in the hiking backpack world yet? We hope you have learned a few things and are left with a good understanding of the best hiking backpacks for when the time is right for your next investment. Buying the best trekking backpack that accompanies you on the lightest of walks to the most straining of journeys is no small task. There is plenty to consider when making your choice, from size, to utility, to durability. All of the choices I've outlined in our reviews will make a hiker happy; they are all great products and we wouldn’t recommend them otherwise. What's most important is to look at the kind of terrain you will cover and the conditions you encounter and make your search from there. So by now, you might be wondering, "Which hiking backpack do I choose?" Well, for one, we tried to make it easy for you, we made our “Editors Choice” top picks in each of the three sections above. Smaller, simpler daypacks like the CamelBak Cloud Walker 18 or lightweight multi-day packs like the O﻿﻿s﻿﻿prey Stratos 50 will make strenuous hikes faster and are generally less work. But if you are going on a long hiking adventure where you will be camping out for many nights (5+ nights) we definitely recommend shelling out the dollars to purchase a high reputation, proven bag like the Osprey Aether 70. There’s always more stuff to pack than you originally think. Sizing is important so make sure you go with the correct size that matches the length of your trip. Whatever your choice, happy trekking! Let us know where your next hiking adventure leads you. Now that you have your new pack, are you ready to take on the world? We created a short, but in depth list of the Top 10 Hikes in the United States. We hope you check out our list and plan your next adventure! Download the 1 Page Backpacking ﻿﻿Checklist﻿﻿! Stop forgetting your gear! We created a simple 1 Page Backpacking Checklist PDF. Sign up for the newsletter and get the free ﻿checklist. Overnight Backpacking Checklist [PDF & Infographic] | Most Important Gear and Tips!